When our mothers and grandmothers ditched bonnets for briefcases, it began a constant and ongoing conversation about guilt. While parenting is changing, with the introduction of two weeks paternity leave for new fathers, is it changing in our minds and hearts, or does the buck still stop with mothers? WMB asked three working women for their thoughts. Sinead Fox is a solicitor and writes the popular parenting blog, Bumbles of Rice. While the traditional legal profession is “absolutely not” family friendly, she works in-house for a financial services firm, which has regular office hours and allows her to take a day a week parental leave. However, guilt is a factor for her, and it’s not something her husband experiences to the same degree. “I think it stems from the fact that since I was at home on maternity leave I got used to being there all the time and therefore in a sense knew what I was missing when I went back to work. the good and the bad. My husband had 3 weeks off when each baby was born and got back to ‘normal’ then when he returned to work.” Returning from maternity leave, she was fraught with guilt for leaving her babies. Natasha Lynch owns and runs the multiple award-winning grinds school Essential French. 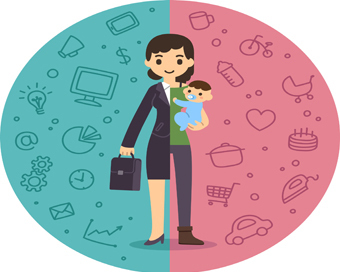 She describes a “constant internal battle” between her children and her business, which requires a lot of work in the evenings, and feels working mothers face a level of judgment – particularly from other women – that men don’t face. Eithne O’Brien is Head of Finance at Laya Healthcare, and a mother of two daughters. The timing of her first pregnancy was not planned, and made for an anxious return to work. “With my eldest daughter I was in a new job and really concerned about the impact on my role in the company. I was concerned how it would be perceived in the company as I was only in the door and out again on mat leave but I need not have worried.” 14 years later Eithne remains at the same company (then BUPA, now Laya), and says the company offers excellent flexibility for new mothers. Eithne O’Brien felt more like herself once she was back at work, doing what she was trained to do, unlike parenting, which has to be learned on the fly. “I try not to let work define me and I relish my time with my kids and family. I try my very best to ensure that I attend all the parent teacher meetings, the concerts and the parties but sometimes being a working mum you do miss out and feel isolated from the other mums at the school gate.” She hopes, however, that she is providing her daughters with a good example of being rounded and independent.